The language of behavior analysis is precise in the sense that it focuses attention on functional relations between behavior and the environment that are extended in time. However, to non-behavior analysts, behavior-analytic terms and explanations are difficult to understand and awkward sounding. Evidence suggests that this has had deleterious effects on the acceptance of the field of behavior analysis and its explanations of behavior. The goal of this article is to assert that verbal behavior that describes behavior is functionally related to subsequent explanatory verbal behavior. In addition, it is argued that technical language is not a requirement of precision and logical formulation. Suggestions are made regarding how behavior analysts can generate evidence to better understand explanatory preferences of individuals with various amounts of exposure to behavior analysis. 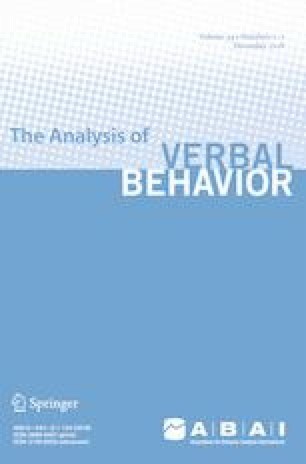 In addition, methods are suggested for introducing behavior analysis to others with vernacular descriptions of behavior and its causes that do not obscure critical distinctions by introducing mental/mediational explanations. I would like to thank Bill Ahearn, Anne Castley Burdzy, Phil Hineline, and Pauline Guerin for their careful reviews of this manuscript. This researched received no funding.